The condition of the car after the crash at Jalan Miri-Pujut. MIRI: A man cheated death after the car he was travelling in crashed into a lamp post and overturned at Jalan Miri-Pujut here early yesterday. 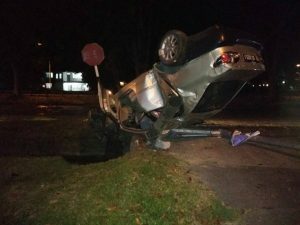 The man in his 20s was said to be heading towards Lutong from the city centre when the car suddenly went out of control, skidded and slammed into the lamp post before overturning by the roadside at around 2.00am. The victim, who sustained minor injuries, managed to get out of the vehicle and contacted his friends for assistance. Man cheats death when car rams lamp post 0 out of 5 based on 0 ratings. 0 user reviews.